The promotional page goes on to say that the mobile site features “Geo Loacalisation”, “The best and most recent prices” and Google maps. All of which makes it sound like hotel.mobi is the answer to travelers’ prayers, finally an easy to use mobile site that actually lets you quickly find and book the best hotels deals using only your mobile browser. 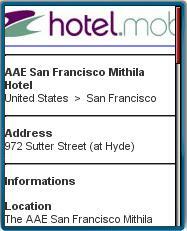 So I went to hotel.mobi with my N95 and typed in “San Francisco”. I got a 115 results, basically just a list of hotel names in alphabetical order; no prices, no address, no phone number and no indication if these hotels had any availability. That’s not a good start, to be useful for price comparison, prices need to be included in initial results and there needs to be a way to filter or sort by price. You also don’t want to see listings for hotels that are full and you need to have some indication of how far away each property is. Not giving up, I clicked on several of the hotels to see if the promised features were buried a bit deeper. When I clicked a hotel name I got a page with just the hotel’s address and a “Display Details” link that led to yet another page with a description of the property and it’s amenities. But there was no map, no prices and no click to call phone number, in fact no phone number at all, although a few hotels did list an mailto: email address or a fax number. I tried using Opera Mini and got the same results as with the built-in browser. What a huge disconnect between what’s promised and what’s actually delivered. I’m hoping that the advanced mobile site described in the press release and on the PC web site is just not quite finished yet and what I’m seeing is an old or placeholder version. I’ll be watching hotel.mobi for the next few days and will update this post if the situation improves. For now at least, Hotel.mobi continues the tradition of mobile hotel search sites being mostly useless. Update: Someone from Hotel.mobi left a comment (see below) saying that many of the hotels in search results for London and Luxembourg do have click to call numbers which I’ve confirmed is true. The numbers are on the main search listing which I like. Listings for Luxembourg also include star rankings, a good indication of price. The sort order is not alphabetical for the London and Luxembourg listings either although I can’t tell what it actually is. Proximity to the city center, perhaps? All in all good news. If the hotel.mobi team continues to build their site by adding more of the features listed on their promotional web page it could turn out to be one of the better mobile hotel search sites. This entry was posted in Hotels and tagged Hotels, mobile site review, mobile UX, Travel by Dennis Bournique. Bookmark the permalink. Basically, hotels that buy the option to be in TOP10 will show up first. In the case no hotels have paid to be in top 10, the hotels displaying their phone numbers, will show up first. The map functions only on the PC browser version for now, and in Q3 it will also be available on major phone brands. Thank you for your comment. I’ve confirmed that all of the Luxembourg and about a third of the London hotels do have click to call numbers and updated the post to confirm that. Hopefully you be able to add phone numbers for the majority of the hotels in other cities soon. Without a way to contact the hotel a listing is of little use to a traveler. 1. In the London and Luxembourg listings, unlike other cities, the hotels are not listed in alphabetical order. What order are they in? 2. When can we expect to see prices and Google maps included in the listings as described on the full web site? We are sorry to see such a negative analyze for a portal into which a hell lot of efforts have been put to address a service for the mobile world. First of all and most important, the Press Release was sent out to announce the official launch of hotel.mobi, and also to get Hotels to contribute to the site by sending all the details they would like to see on it. Indeed, we have listed the hotels, posted the basic information and it depends now on each Hotel to send more. If you look at London or even Luxembourg, you will see that a lot of Hotels already have their description posted, with a ‘click to call’ functionality. As soon as the hotel filled in their phone number phone details the click to call function works. Regarding Geolocalization we have implemented IP address localization and GPS requests to the phones that have GPS. In future CEllID localization databases will be implemented to improve this function, though we believe the future will have mostly gps incorporated in majority of phones.. The site is continuously being improved and filled up with information by the Hotels themselves. This is an important point that will really change traveler’s lives and allow more flexibility and mobility.